Advanced webform functionality is available for Mosaic sites on request. the Recaptcha's Site key and Secret key need to be input on the Site Settings > Form spam protection tab (follow the steps in the 'Setup Google Recaptcha' section) which will appear in Site Settings once Webform functionality is enabled. 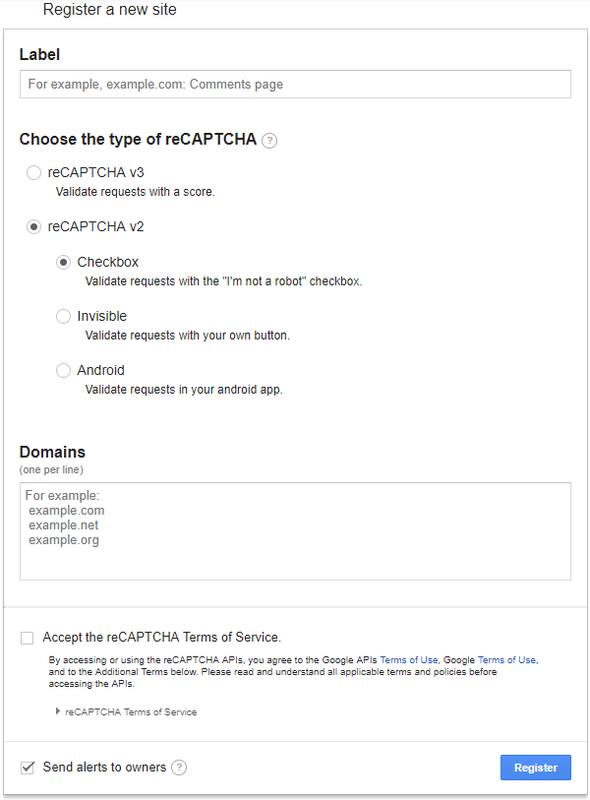 Note: you will need a Google account to complete the reCAPTCHA setup. If you do not have one, you can create one during the setup process. When webforms functionality is enabled on a site, a Form Builder user role becomes available to give to users (see Users > 'Add' new user/Edit current user). In order for a user to create or edit a webform, they must be given the Form Builder role. Once the Form Builder role is associated with a user, a Webforms screen will be visible in Manage Content. Webforms are created and managed within the Webforms screen. Once forms have been created they will be listed on this screen, where you can view, analyse, and download submissions. Forms' editing screens can be accessed from this screen.